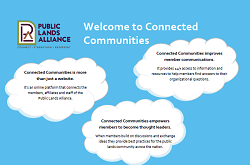 With more than 1,000 users and 900+ discussions on public lands topics, Connected Communities is your place to exchange ideas and resources. If you are a Public Lands Alliance Member, your board, staff and volunteers receive 24/7 access to information and announcements generated by your public lands colleagues and Public Lands Alliance staff. Visit the Member Forum to engage with your fellow nonprofit members today! Market Circle is an online forum dedicated to buyers within our membership and our Corporate Partners. This group discusses product and service ideas and finds innovative ways to enhance relationships in retail. To view the full list of communities you can join, click here. To access the forums and directories, you'll need your individual username and password. Don't have one? Contact us to make a request. Once you're ready, sign in using the button below. Check out the Member Forum for public land nonprofit interests and Market Circle if you are a buyer, a Vendor Support Program donor or if you're interested in retail. Members have access to online member and vendor directories, making it even easier to stay in-touch with professionals you met at our in-person or online learning opportunities. Download our step-by-step guide to get started on Connected Communities right away.